I’m back home for Christmas in wee welsh Wales. My original plan was to head up to Scotland for a little boating bootie this week, but the -16 C weather and my injured boating buddy conspired against traveling north. 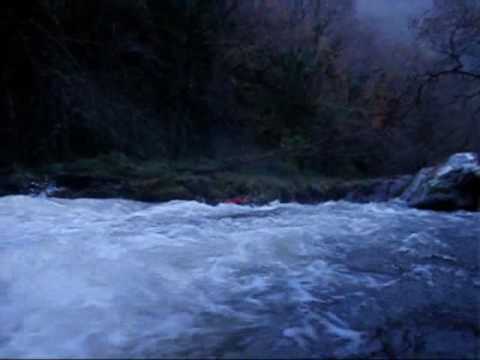 Chris C. (Swansea Canoes) and I decided to beat the post tryptophan blues and hit one of the welsh classics. 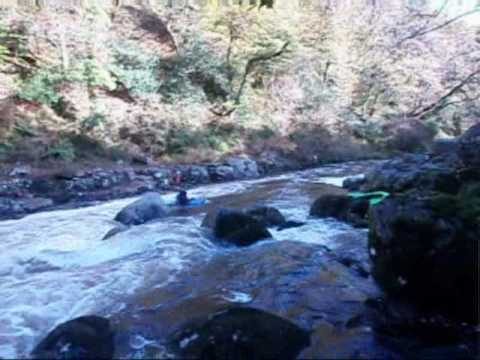 The Mellte is a IV+ river in South Wales’ beautiful Neath Valley. We knew before we left that river levels were low, and admittedly it was a bit of a scrape down, but with the sun shining and icy bankage, this run was simply magical. So the 50 fter was a no brainer. We did not want to run that. We talked about running the 15 fter, immediately below but a rock overhang at the top of the drop looked like it may be a bit of a head banger, so that got portaged too. We did not run the 25 fter further down the river due to lack of water, but we ran everything else. I am looking forward to returning when the mellte has more water to run some of these drops. A fantabulous day on the water. Levels were about level with the slab when we got on at Dartmeet dropping to about 1 inch below by the time we got off at Newbridge. It was a good level for practicing some technical moves, working the rapids. We re-ran several rapids, practicing more technical lines and there were some excellent boof practice spots all the way down the run. And euthanasia was at an awesome level. Tom with a powerful low-brace. Its not playboating ya know! I guess you have to look on the bright-side, at least our boats are a bit lighter to carry now; the Erme hike in will be so much easier with those few lost ounces. Me taking my fav line next to the big boulder. It is doubtless in my mind that SUPs is cementing itself as an emerging and growing paddlesport. On a trip to florida last weekend I was entertained by (if slightly jelous of) the SUPers. I wonder how well skills from whitewater kayaking transfer, if at all, to this cool watersport. And what better place to determine that than in the 80 degree water/air temps, but no time on that trip, so i’ll just have to return…what a shame! One of the rivers on my list of “to run” for a long while now has been the east Lyn. Its a 3 km stretch of very interesting whitewater. It is possible to start further upstream and turn it into a 7 km run, but access is not allowed to this part of the river. Dave, Tim, Chris and I put on at watersmeet at a good level. There are a couple of nice boof drops and one boudlery rapid before the gorge. We inspected the whole gorge before making a decision on what -if any- section to run. Chris, Tim and I put on at the start of ” Crux 2″. It was a great confidence boost section. In fact I thought the gorge looked much more manageable at river level than it did from inspection up high. I am told though that most people think the opposite- guess I’m not most people- my mum always told me I was special. We met Dave after the gorge section. I was so content after this run for many reasons, but one prominant motivation stuck out immensely- paddling a river right into the sea. It was a surreal experience for me. One minute I was paddling class 4/5 and the next surfing in the sea. I’ve put together a video from our run, most of which was filmed courtesy of Mr Power. Yes, 48 hours and double runs on the Dart. A few weeks ago we spent a wonderful 2 days based at the River Dart country Park. Its now reopened for use by kayakers (after a series of incidents led to our breed being banned). One of the nicest bunkhouses i’ve stayed in and the food was worth the cash! Great levels on the upper dart- it was one inch above the slab on the Saurday and about 3 inches above the slab on sunday. Its amazing what a difference a few inches can make . Saturday we hightailed it down the upper, loop and some of the lower, just in time to get to the bar and see Wales creamed by NZ. Sunday we just blasted down the upper to leave enough time for a cream tea before the trek back to the hampshire flatlands. Yummie. See video of Tom, mine and Chris’ line down the right of suprise suprise.